Terms and Conditions - Lhasso Adventure Pvt. Ltd.
Lhasso Adventure Pvt. Ltd. has promulgated its terms and conditions for all its trips – trekking, mountaineering, hiking, rafting, wildlife safaris, mountain biking – and any other services operated by the company. Before completing the registration form and signing the declaration, please read these terms & conditions carefully. They set out your agreement with Lhasso Adventure Pvt. Ltd. contain important information. At the time of booking and completing your form a non-refundable deposit of $US 200 per head is payable. The balance of the trip is to be paid in full at least 21 days prior to departure. At least 1 week prior to departure, we require the booking form and a photocopy of your passport, so we can start processing all the logistics. Reservations can be accepted as late as 1 week before departure but full payment must accompany the booking form. Earlier bookings are strongly advised. Lhasso Adventure operates trips in regions where standards of accommodation, transport, safety, hygiene, food, medical facilities and other infrastructure may be lower than those you normally expect. Please keep in mind that Nepal is a third world country, and bear the above in mind when making your booking. In the areas that Lhasso Adventure serves, flight and other transportation may be delayed or cancelled for your safety. This could be for reasons of such as dangerous flying weather, dangerous trekking/climbing conditions In these events, the following standard “Natural Disaster” policies apply. These policies are standard in the industry and you will find that all agencies like ours have them. In such case clients are 100% responsible for the additional accommodations, transport, meals, or other expenses that result from such unexpectedly delays at the location where we must wait. Additionally, there are no refunds for any lost reservations at accommodations, or facilities, at the destination location. Lhasso Adventure covers only the lost staff wages (e.g. porters waiting on the other end) from such delays beyond our control. This is one reason we strongly recommend to our clients to purchase recommend travel insurance, as described below. Where Lhasso Adventure provides a service it will do so with due care and skill. Lhasso Adventure is not responsible for the acts and omissions of others, including airlines, accommodation providers nor are we responsible for any loss, damage or expense (including loss of money paid in advance) which you may incur as a consequence of the acts and omissions of others. Lhasso Adventure will not accept responsibility or liability for any passenger who contravenes any law or regulation of any country visited within the confines of the trip. Any independent arrangements that you make are entirely at your own risk. *No refunds will be made for any unused services, accommodation etc once the trip has started. *If a client decides to leave a trip before its completion, no refund will be given for the unused portion of the trip. *If a client wishes to extend the duration of a trip after the trip has started, this may be possible but payment will need to be made prior to this taking place. 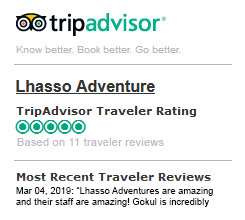 *During the trip clients are required to stay at the hotel or lodge chosen by Lhasso Adventure. If a client wishes to stay elsewhere, they will have to bear the cost of accommodation and food in the alternative lodge/hotel themselves. If a client prefers to stay in a different hotel in Kathmandu this could be possible but it would have to be negotiated when the booking and final payment is made. In the event of Lhasso Adventure canceling a trip as a result of a Force Majeure, or government travel advice clients will be offered alternative arrangements. If you agree to the alternative, and the price of the alternative booking is less than the original booking, we will refund the difference. If you do not accept alternative arrangements, we will refund all payments (less transaction fees). However Lhasso Adventure will not be liable for any additional costs incurred by you. If you have any complaint that cannot be dealt immediately with your tour leader, or you are not satisfied with the response, please notify us in writing within 10 days of the completion of your trip. We will do our best to resolve the problem. Insurance is compulsory on all Lhasso Adventure trips. We advise to bring proper Travel Insurance to all the travelers who are interested in trekking/mountaineering in the Himalayas with us that covers emergency evacuation including helicopter rescue, air ambulance, medical treatment, theft, loss of belongings, last hour tour/ticket cancellation, death, personal liability, etc. Please note that most standard travel insurance policies DO NOT cover all of these things of your trip essentials. Guests are required to carry a proof of insurance policy with them and keep a copy with us in Kathmandu office. Regarding the trekking crews including trekking guide, mountaineering/climbing guide, trekking cook and trekking porters, our company have insured for all of them annually. Trekking in Nepal is walking on the path or mountains and in mountain areas the health treatment services are not standard and easily accessible. There are few available good hospitals and doctors in the mountainous regions. Therefore, if in-case the trekkers suffer from severe sickness, s/he should be brought to the close city or Kathmandu ASAP. The best option could be Helicopter rescue arrangement for the better treatment because Nepal does not have quality paved roads to drive to the hospitals in the mountains. In the event of serious illness or an accident in the Himalayas, we get the update from our guides through satellite phone/cell phone where there is network coverage. If the case is worse and emergency evacuation/rescue is required, then we will coordinate with our helicopter rescue companies to arrange very swiftly. The very first phone call to the insurance company with insurance policy number and all other details is very important because a case file will be opened and it is vital to ask for and record this reference number and for their consultation. Once the helicopter is on its way then you will be told how long it will take. At this point you may be lying in bed or in the clinic, possibly with an oxygen mask on, if it is a case of altitude sickness. Sometimes it can be hours until they appear because the pilots will not risk flying in cloud and it cannot land anywhere, so a decision will be made by the pilot as to where will the optimum spot. This may mean being carried for a short distance. Your guide(and some of the team) will have prepared your day sack with some important items to take with you. These should include your insurance papers, wallet, passport and tickets, some clothes to change into later, toiletries, mobile phone, book, camera and anything valuable. Your main bag of hiking gear can stay with the group and come back down later to Kathmandu if the pilot does not want to take it on the helicopter. It will arrive back in Kathmandu to go with you on the plane home, or be sent by cargo at a later date. The helicopter flies to Kathmandu and lands at the domestic airport, where our staff will be ready with a vehicle to take you to hospital, or there will be an ambulance if you require a stretcher. Once you arrive in the capital the altitude symptoms will disappear fast, leaving you feeling rather weak, a bit shaky and probably coughing a lot from the dry air in the mountains. The hospital staff will carry out a number of tests to check your hydration levels, any fluid on the lungs and your blood pressure. One of our staffs will be with you through the treatment period at the hospital. The cost of a helicopter varies depending on where they have to fly to. It can be anywhere between USD$3500 and USD$10,000 for evacuations, so it is important that your insurance policy can cover this amount. The insurance company will follow your progress and keep in touch with the medical staff at the hospital. In most cases they are able to pay for treatment directly but it may have to be your credit card that suffers initially. The helicopter company may take an imprint from your credit card when you arrive in Kathmandu to cover a deposit, which can be 45% of the total amount. We also recommend that you inform your Embassy/Consulate of your situation if it is serious enough. They can visit, advise and assist.